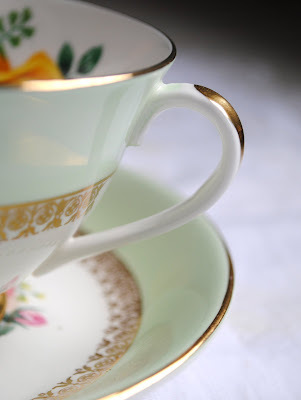 Welcome to another Tea Cup Tuesday! Last week I shared a cup with you that was a mistake! You were all so kind and did not even tell me that the photo of the back stamp was not the same cup as in all the rest of the photos! I had taken pictures of two different green cups and mixed them up! So the mystery cup of last week was actually this cup here today! I apologize for my mix up. no one has any information about. It is a simple, but pretty vintage cup. I would put it around my birthyear, 1959. It has plenty of little cinder marks on it...it was not made carefully. But I love it, I love the green color. 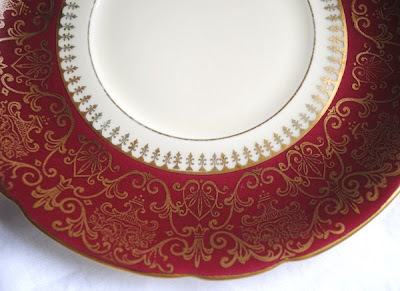 I love the gold filigree trim. 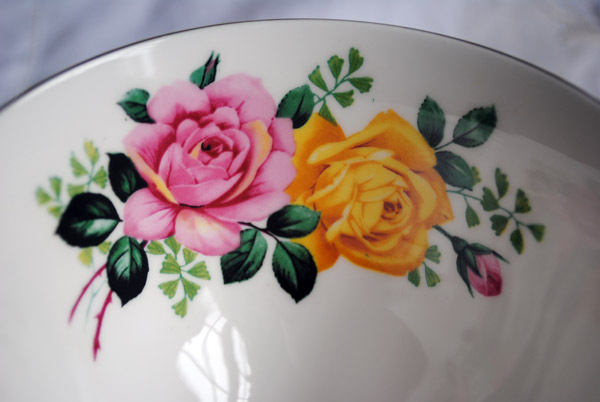 I would have never put these two color of roses together, but on this cup, it looks quite nice. We have been having dark winter days here, and I have been finding it difficult to photograph in natural light. The colors above are a little harsh. The cup is prettier in "person"! And as you can see it was made by Royal Imperial, in England. 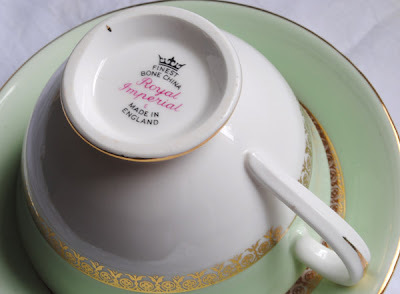 My favorite tea for this cup is English Breakfast. Mmmmm, with cream and sugar! It is a very classy cream soup bowl! I love it, I have wanted a cream soup bowl! My sister bought one for each of us girls in our family. It has very pretty detailed gold designs on it. And as you can see, it was made by KPM. Thank you so much for coming by and visiting. 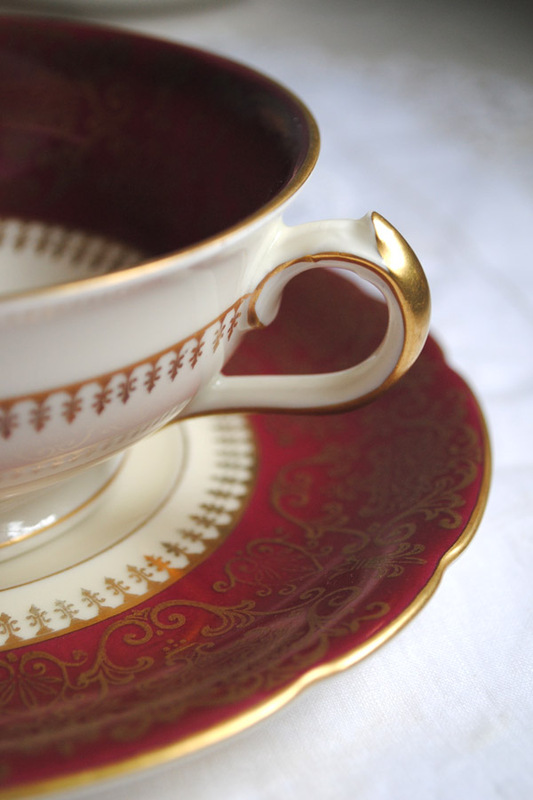 If you would like to share one of your teacups with us please sign up below with Mr. Linky. Martha and I have been hosting this party for 10 months now, and we will be having an anniversary soon. I think that would be a perfect time for a tea cup giveaway! I want to let you know, that the crepe paper I use in my Crepe Paper Flower video is now available (after a long drought) at Paperwhimsy.com. 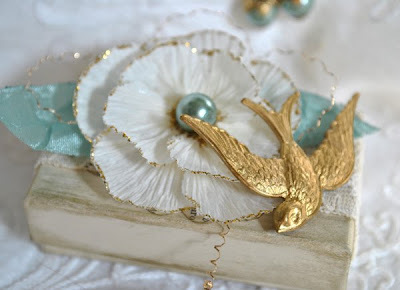 This is so fab, it is very stiff crepe paper and lends itself well to flowers. It comes in three colors, pink, blue and cream, all in one package. Paperwhimsy has the most gorgeous high quality images available. It is worth a trip over there to the shoppe to see! I also have some new videos all ready to debut this weekend. Love your Teacup. Your soup bowl is simply gorgeous. Beautiful cups and the bowl is gorgeous, it must me nice to have a nice soupe in a bowl like that, so chique! And I love your flowers, looking forward to the videos! Very pretty cup Terri and the soup bowl is indeed elegant. I am finding I am making loads of batches of home made soup in this cold weather - it warms the heart. I love your flowers. I must try and get hold of some of that crepe paper, not sure I will be able to get it in the UK though. I love your *mistake* cup and the cream soup ... WOWOWOWOW!!!! I love the bright roses inside the cup, brings a little color to these drab winter days...The soup bowl is just gorgeous too...your sister has wonderful taste. Your teacup is lovely. The soup bowl is gorgeous and I just love the colour of it! What a lovely gift from your sister. 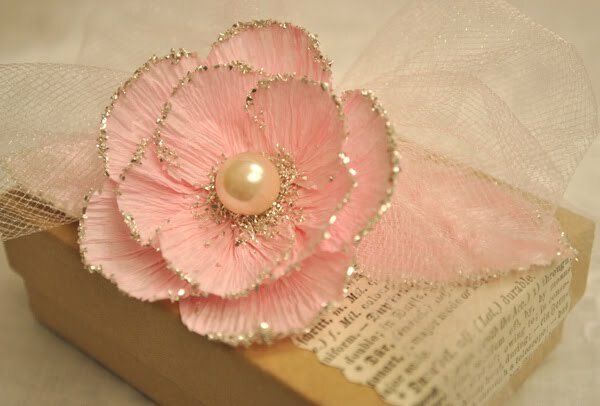 Receiving a gift like that is so much fun! Thank you for sharing and have a wonderful week. Your cup and saucer is just lovely. The soft green reminds me spring is coming. And the soup tureen is stunning. What a nice gift. Thanks for sharing and for hosting this fun party. What a beautiful soup bowl. What a sweet sister you have. Love the colors on this set. Can't wait to see your videos. What a lovely cup and saucer. Again the colors are so pretty, and it really doesn't matter that it wasn't made so carefully...we all have some imperfections, yet look how much we have to offer. 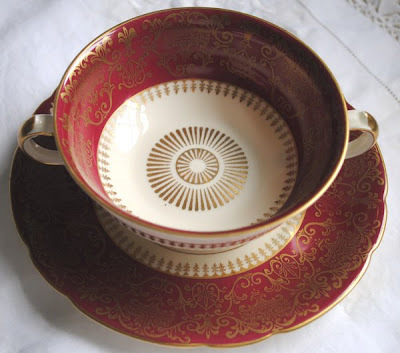 Your sister has beautiful taste, and the cream soup bowl set is wonderful..perfect colors for the season. Enjoy, and let us know what kind of soup you make for it. The first cup is very pretty and the cream soup bowl from your sister is gorgeous. Looking forward to seeing your new vidoes. Such a pretty green tea cup. It is similar to the one featured in your last post ... they would make a perfect tea time for two!! we should have a tea party terri. It would be show lovely. you have a beautiful collection. Hi, I love your Tea Cups they are just breathtaking..how very beautiful..I think I may have been confused when I linked my blog...didn't know it was for tea cup collectors..although I do have some I may share in the near future. Thank you so much for your lovely comments so glad you stopped by. I gasped each week when I read your teacup post dear Terri! all so beautiful from one week to another and makes me envy with good caused! teehee.. love love love your green teacup.. i love the colour.. just lovely. I dont have that kind of colour, yet.. so.. thanks again for sharing and wishing you great day! Yay..more magical cups! do I ever love that red bowl..gorgeous and decadent! Wonderful! and yay..some new tutorials..you are so awesome! I look forward to checking them out..you are so wonderfully talented and so generous for sharing your magic! Dear Terri thank you for stopping by and your great comment ! Your blog is beautiful and I will regularly pay you a visit. 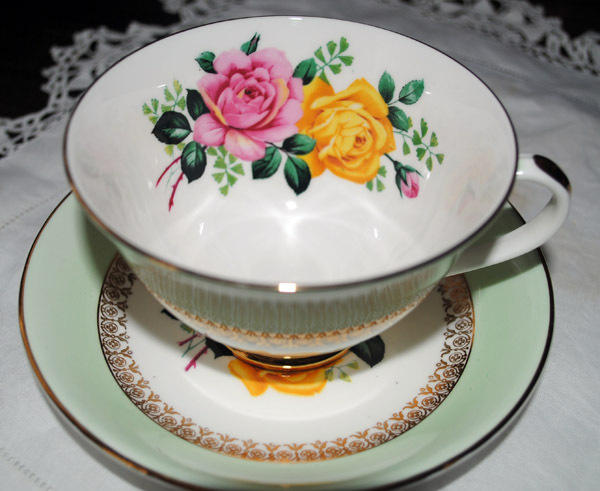 The teacups are so pretty, and your flowers and boxes divine! 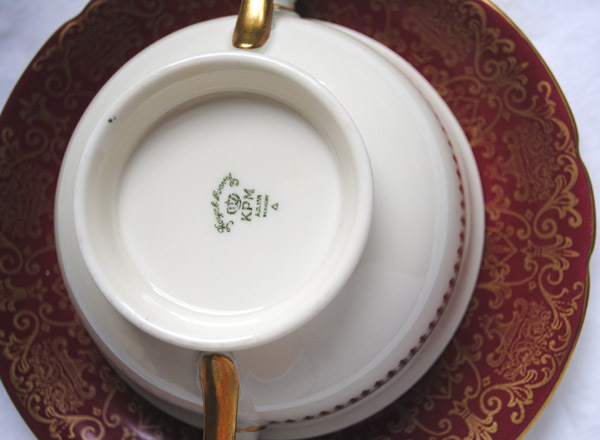 Your teacup is so pretty and I love the cream soup bowl, I've never seen one of those. Ohhhhhhhhhhhhh, the burgundy is BEYOND dreamy!!!!! A New Year and a New Cup! Tea Cup Tuesday!